E.T. 's homeworld, the Green Planet, is dying. Only E.T. has the power to save it... and only YOU can bring him there. Board your flying bicycle and sneak him through the woods – past the police and scientists searching for him. Then take off and fly over the city, past the moon and soar across the stars together. At the end of your journey awaits his magical planet, filled with unforgettable creatures who greet you in song... with E.T. himself there to thank you personally. 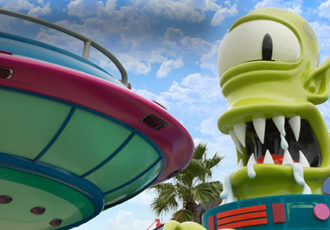 As with other attractions in the KidZone area, this ride opens an hour after the park during slower seasons. It will open with the park during peak time. Plan your day accordingly and see park map for hours. The wait time can reach 30 or more minutes quickly after opening, reaching up to two hours on busy days. Plan to ride in the morning or late afternoon. If your child is not familar with the E.T. character, him and his alien friends may seem somewhat frightening to them. The ride can be dark at times, but ends with a happy, colorful celebration after you "save" the Green Planet. 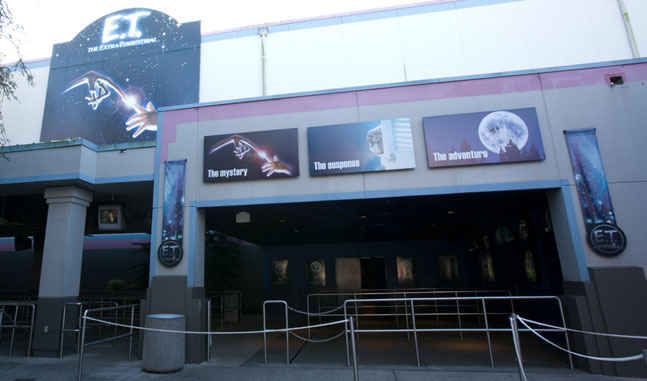 Guests receive a personalized farewell from E.T. himself at the end of the ride. 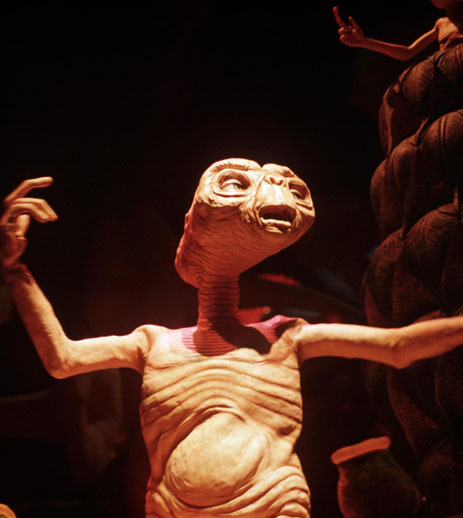 In 2014 the voice system was completely overhauled and E.T. can now say over 20,000 different names.